The Los Angeles Lakers are coming off a horrible loss and a new wave of rumors and news have emerged. Kobe Bryant said after the rough 116-75 loss to the Golden State Warriors on Sunday that the Lakers have been working hard and may have been worn down. “Kobe says everyone has pretty heavy legs right now, says they’ve been practicing really hard,” reported Lakers Nation Serena Winters. But Kobe believes that the team will be fine once the regular season starts. “We haven’t started tapering down yet,” he said, reported Lakers reporter Mike Trudell. “Thinks guys will be more fresh ahead of the regular season. 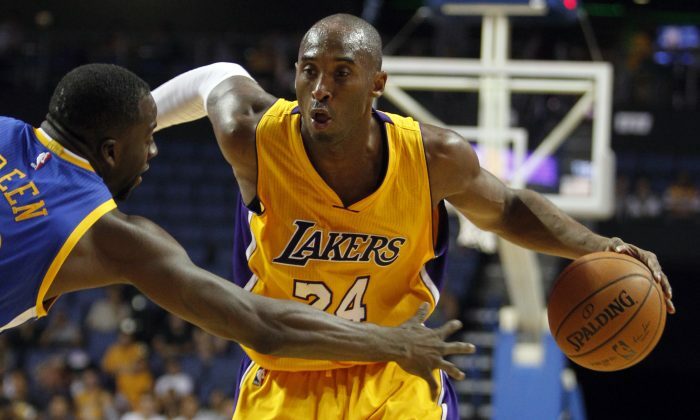 Focus now has been work,” Trudell said, paraphrasing Bryant. Bryant also praised the Warriors, who he said are an excellent team. They got some phenomenal players over there–that’s a problem for some of the top defensive teams in the league to deal with,” he said. 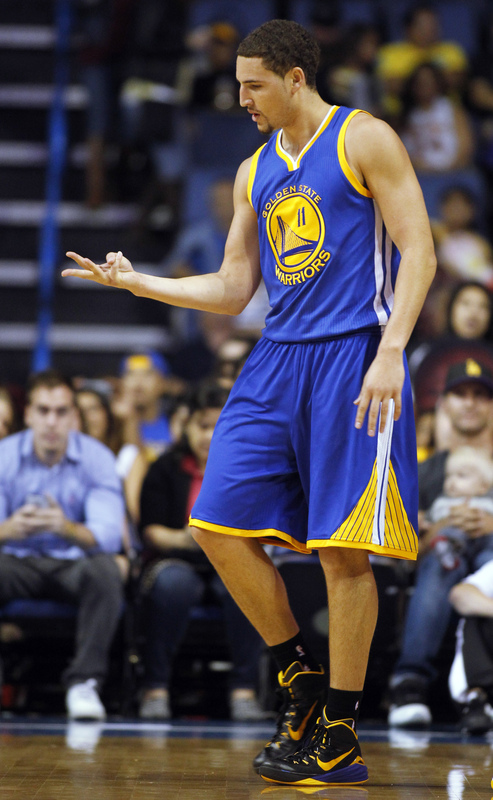 The Warriors have until October 31 to extend Klay Thompson. If not, he becomes a restricted free agent next summer. A fan website claims that the Lakers will target Thompson if the contract talks don’t work out. The Lakers have expressed interest in Thompson before. And the Lakers tried to pull off a trade for Thompson earlier this year before the NBA draft. Mike Bresnahan of the Los Angeles Times said that the Lakers wanted to deal the seventh pick in the draft, which became Julius Randle, for Thompson as part of a three-way trade that would have also involved the Minnesota Timberwolves and Kevin Love. The T’Wolves later traded Love to the Cleveland Cavaliers for multiple players. Steve Nash, the oldest player in the NBA, informed coach Byron Scott that he didn’t feel good on Sunday night. Nash, 40, asked Scott to take him out of the game. “Byron Scott said Steve Nash told him he was done for the night, said he just didn’t feel right,” Winters said. Nash, like Bryant, has dealt with injuries over the last couple seasons. But both have been practicing hard and appeared to be ready for the season. The Lakers are getting thin at point guard, with Jordan Clarkson straining his calf and Jeremy Lin spraining his ankle recently. Both sat out the game against the Warriors, along with Xavier Henry, Ryan Kelly, Ed Davis, and Nick Young. Ronnie Price and Keith Appling are the other point guards currently on the roster. Clarkson will be out until Friday, at least. Lin sprained an ankle at practice on Saturday, and will be evaluated again soon. “He got up and kind of walked out on his own, but he was in a little pain,” Scott said, reported the Los Angeles Times. 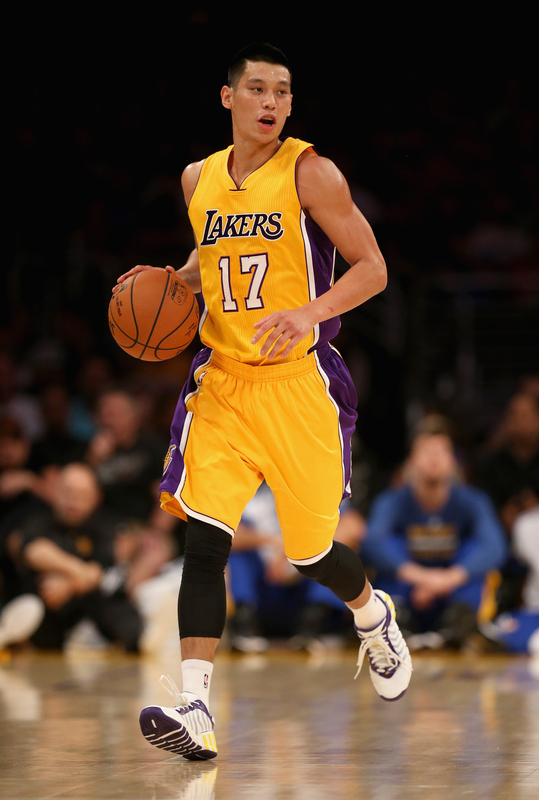 Lin had replaced Nash in Thursday’s loss to the Warriors, scoring 14 points and adding four assists in 21 minutes. Some believe that Lin should be starting over Nash, but it may come to whichever guard is in better condition to start the season. Scott said that Lin should be ready to play on Thursday against the Utah Jazz. A number of season predictions have been coming out and the latest has the Lakers missing the playoffs. “If everything were to go perfectly for the Lakers this season, it would still be tough to envision a win total of more than 45 games — and even then, that probably wouldn’t be enough to reach the postseason in a traditionally loaded Western Conference,” reported NBC. The Lakers have high hopes after acquiring a number of new players, including Lin, Carlos Boozer, and Julius Randle, but will have trouble making it to the playoffs. The San Antonio Spurs, Oklahoma City Thunder, Los Angeles Clippers, Dallas Mavericks, Warriors, and Memphis Grizzlies will, barring any unforeseen developments, finish far ahead of the Lakers. That leaves only two spots up for grabs, and the Lakers will have to compete with the likes of the Houston Rockets, Portland Trailblazers, and Phoenix Suns.